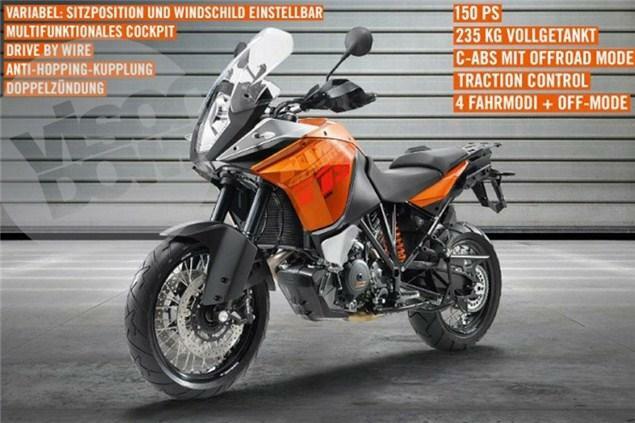 IT was perhaps a fortuitous 'accident' that on the very day Ducati revealed its updated, 2013-spec Multistrada, the firm's Austrian rival KTM briefly posted an official image of that bike's most obvious rival on its own website. Quickly grabbed by the ADVRider forum, even though the image was taken down by KTM it's been impossible to put the cat back in the bag. Although after endless spy shots and even a road test of a prototype by German magazine Motorrad, the bag's been untied with the cat coming and going as it pleases for some time now. What's really new here is a glimpse of the final paint scheme – orange, of course – and a few specs. With 148bhp (150PS) it's bang on Multistrada pace, while the weight, at 235kg wet, is pretty close to the Multistrada Touring's 220kg. With four “driving modes”, traction control, multi-mode ABS, ride-by-wire and an adjustable windscreen also revealed, it looks like it's got the gizmos to rival Ducati, too.